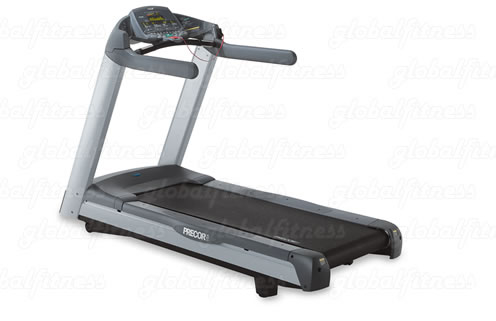 Precor's premier treadmill, the 966i, appeals to professional trainers and novices alike, with its quiet motor, smooth rollers, and extensive workout programs. It features a durable running deck made from exceptionally sturdy Slikdeck material that requires no lubrication and can be flipped – doubling the life-span of the deck. Also, the 966i employs a convenient "Cord Management System", keeping bothersome wiring underneath the frame and out of the way, and the touch-sensitive monitor switches are more reliable and result in fewer repairs. Dimensions: 88" X 37" X 57"